Many Canadians feel that the cost of local housing, whether purchased or rented, is beyond their means. Affordability is especially an issue in Toronto, Vancouver and Calgary. Less in the news are non-residential properties and the hardships their rising property taxes are causing to small businesses. It’s an expense that is causing small businesses to relocate, reconsider expansions and, in some instances, shutter, notes a recent Globe and Mail Report on Business. The process for assessing a commercial property’s value varies across the country. Some municipalities base commercial assessments on a property’s best potential use, as opposed to actual use, and as a result “end up with a property liable for a tax bill that doesn’t reflect the income stream the property is earning,” notes the article, quoting the executive director of the Toronto Association of Business Improvement Areas. 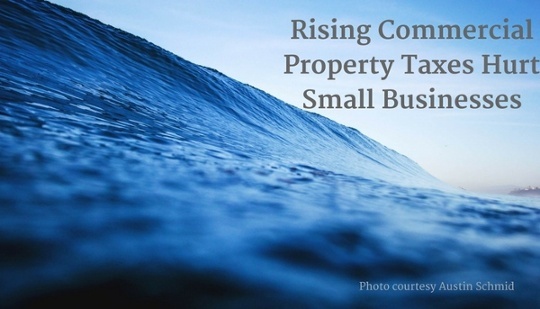 First of all, even though a small business has a few bad years as a result of a declining economy their property tax continues to rise. Secondly, government wages and benefits including pension have grown to be far in excess of what industry and small business can afford. This dynamic seems unfair to me and cannot be supported long term. Finally, the tax system does not work. It may have worked when municipalities funded roads, water, sewage, and garbage. But now they are providing housing, social services, transportation, etc. etc. and yet the source of their income to fund these services is still property tax. And with the related increases in taxes, seniors and others who live in appreciating property are being driven out of their home. It would be more appropriate to use income tax, which is relative to what people can afford based upon their income. The municipalities could calculate their needs and the funds could be collected by Revenue Canada through an income tax surcharge that would vary based upon the municipality of residence. That approach would generate the same money and be more humane. I have proposed this to the province however the system will only change when there is sufficient political pressure. Back to the disparity—the tax rates for businesses are much higher than the tax rate for residences even though the businesses use fewer services. Garbage collection, snow removal, the maintenance of parks and the education budget, for instance, are all part of the package of municipal services included in the assessment. A real-life example: The property tax for our Ottawa-based office is $50,000 per year based upon an assessed value of around $2M. My house is assessed at one third of that but is taxed around $6,000 per year. So the commercial property is paying three times the tax based upon the same assessment. I don’t think that is fair. Do you? Whichever way you slice it, small business pays way more than its share. Do you own a small business? Check out my other posts directed to small business owners.